Thanks, Nick. I love the idea of an Apprenticeship program for SS coach development. In any profession, working under the guidance of an experienced professional is the best way to create new ones. As for me, there's not likely to be a Starting Strength Gym close to me anytime soon, but I will keep an eye on the opportunities anyway! The Prep Course looks like will be great for me. Here at the start of 2019 it looks like a good time to set up my separate business checking account and credit card for coaching/training and start making things more official... So thanks for providing the impetus for me to get that going... I'll sign up shortly, as soon as I get that squared away. Excellent. We'll see you soon. Each student is assigned a SSC mentor who works with them, gives feedback on their assignments and progress, and is there to help them succeed. You can start at any time. The course is set up to be flexible so that it can accomodate any schedule. 2. Can I complete the course if I am not coaching? No. The coach prep course integrates coaching assignments each week that must be completed before moving to the next module. 3. Do you know of any places where I can start practicing coaching? 4. How much time will it take each week? The time you take to complete each section will depend on your background preparation and how deeply you go into the additional resources that are provided. 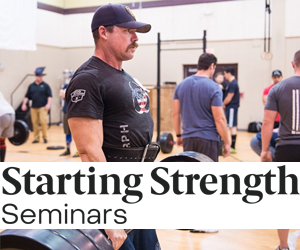 If you're already well-versed in the foundational texts (Starting Strength, Practical Programming) and have a basic understanding of physiology and physics, you'll have a head start. review the core presentation for each course module ~ 1 hour. written assignment ~2 hours. Longer times will be needed for those who are not as familiar with the material and/or who are unused to writing. coaching assignments ~ 1 hour. Since you will already be coaching, the additional time over baseline will be minimal. Depending on the assignment, the extra time may be for setting up to record video, processing/uploading video, and/or reporting results from the task. Studying the additional and recommended resources will take as much time as you invest. These include sections from the Starting Strength and other foundational works, articles, videos, online resources, and other textbooks. I live in Israel and now i am serving in the army here so i can't leave the country right now. After finishing the army i thought to myself to work sometimw to gwt enough money so i will be able to come and learn more about the SS method and how to coach the right way. I have the blue book and the SSPT3rd and i am planning to buy the Barbell prescription soon. I asked Rip if my mom wants to start training how do i teach her and Rip sayed that i need to figure it out by myself so i think this is another step that i will need to make and start learn how to coach by myself. But, specifically what else do i need to learn/ read to explore deeper? I am also doing the LP right now and still on it. Learn how to get more clients to coach than just your mom. The evaluation tests for applied knowledge, i.e. experience. Ok. Its pretty difficult cause everyone think jogging and running on the treidmill and doing half squats on smith machine is the way to become "Bigger" and "Stronger".